The account below was written by Dave Bowden sailing on his Grainger 420 Catamaran This Way Up. Most yachts have departed Indonesian waters as their cruising permits and visas have expired. Several yachts who had medical or engine problems are still transiting the Singapore Straits although they have formally cleared with Indonesian authorities. Crossing the Straits is interesting from any perspective - listening to the Straits traffic controllers on cluttered VHF channels, watching the variety of ships in trail as they use the several traffic separation zones across and along the Straits and then finally making your own crossing. We had left Nongsa Point Marina on the NE tip of Batam Island (very nice but not many customers) late one afternoon and headed west along the waters south of the traffic lanes seeking a quiet spot for the night. We passed between many anchored ships, barges, drilling platforms against a floodlit shore line indicating anything but a deserted mangrove and reef shore. Our selected spot was reached just on night where we were surprised to find a couple of yachts also anchored. Dawn showed them to be some colleagues from the rally so we all ventured across next morning. It is not a crossing to be undertaken in bad weather as you need to be able to see the traffic (all doing 12 knots) and plan your movement accordingly (6 lanes where we crossed). Ours was simple enough and after crossing we headed for the Three Sisters Islands for the Western Quarantine and Immigration anchorage where we were processed in 15 minutes. We did not even anchor, just held position in the current and the Immigration work boats come along side to receive and deliver passports and paperwork. The Straits and local channel currents are strong so make sure you know what is occurring if you want a fast passage - Total Tide from the UK Hydro will show currents where as WXtide32 does not. It floods west in any case. Most marinas will handle your inwards yacht clearance for a fee but we chose to go downtown ourselves to experience the Port of Singapore Authority (PSA) One Stop Documentation processes. It must be completed within 24 hours of arrival (cost SD $ 30 valid for 1 year) and the outwards clearance process is similar but no additional cost and valid for 48 hours after processing. We are not sure about any departure tax for yachts. Again most Marinas will do this for a fee. It only took about 3 forms and 15 minutes to be completed. What a change from Kupang!! So the Singapore experience starts. Many yachts went straight to Malaysia either at Sebana Cove on the east tip of Johor or to Danga Bay on the west tip of Johor a few miles up the causeway channel where a new Marina is opening. There are pros and cons for staying in either Singapore and Malaysia - marina fees are less in Malaysia and while road/ferry entry to Singapore is easy you pay a departure tax each time you leave. It can add up to the extra Marina costs of staying in Singapore and the convenience of basing in Singapore is very attractive. One issue for yachts in marinas on the south coast is the effect of wash from boats passing marina channels as this wash can be severe and causes yachts to rock and pull at moorings lines. Given that these are serious upmarket marinas catering to mega yachts, the lack of foresight in not building a protecting entry wall to stop this wash is unusual in a country where even pedestrian side walk rails are all quality stainless steel construction. Marinas have free WiFi and in some phone calls are also free. The associated Club facilities are top class. The financial crisis has opened a few cruiser's eyes as we convert home currency to Singapore dollars. Meals at the attractive food courts in shopping complex are still better priced than Australia but are more likely to cost $5 or more rather than $1-2 we had been used to paying in Indonesia. There are plenty of places to choose with matching prices but it is the change that strikes you and generally dominates the conversation. There is no graffiti, rubbish or dirty areas. There are cleaners everywhere. Roadsides are trimmed with shrubs and trees and there is a pleasant feel in the surroundings. Transport systems are efficient, fast and while packed at peak hours are often under utilised at other times. Shopping is great for the admirals but again we marvel at who is going to buy all the merchandise we see in these beautiful shops? Electronics are all the go - prices are similar to Australia but the recent exchange rate changes has complicated any useful comparison. One look in the supermarkets is enough to convince you that anything you need in the way of food is available. Technical support can also be found but Marina chandlers are not that comprehensive although it is early times for us yet. The morning HF sked has almost stopped as it is always hard to hear while moored in marinas. The back up all pervasive Indonesian mobile phone system we all used for the last 3 months (very cheap too) has lost its effectiveness and there is no comprehensive listing of new numbers (Singapore or Malaysian) acquired by each yacht. And so that vital Rally mechanism for passing and receiving information that we have found so important and useful over the last 3 months is no longer available. It will start again when the Malaysian Rally begins but by then Singapore information will have lost its priority. The fleet gathered at Belitung Island for the final Dinner and farewell. It is a reasonably large island which does not rate a mention in The Lonely Planet but is trying hard to be recognised as a tourist spot. Yachties found the anchorage very pleasant although the occasional afternoon NE sea breeze created a chop which flattened out to a mill pond by midnight. As the fleet moves NW towards Singapore we are crossing the transition weather zone (effectively the Doldrums) where there is no wind, and showers and thunderstorms are common. This is what we have experienced and those yachts already heading to Singapore about 325 miles NW of Belitung report the same. There are apparently lots of large logs in the waters around the Equator. For this and other reasons we plan to day sail our way to Singapore taking about 10 days which will bring us to the end of our 3 month Indonesian Visa period. Belitung has been a fitting climax to this long, busy and very enjoyable Rally cruise. The beachfront is well equipped with stalls, restaurants, mandatory stage and decorations (every shop, entertainment or beachfront we have seen in Indonesia is always adorned with banners). These shops are rudimentary by Australian standards but practical, comfortable and suitable for such a setting. Bamboo is the favoured building material and provides the framework for the building as well as walls and seats. Floors here are sand. The offerings range from every type of fresh and packaged food, souvenirs, drinks and restaurants offering delicious local meals starting at AUD $2. The stage was decorated with a bamboo skeleton of a local boat. The ingenuity demonstrated in the use of bamboo is incredible. About 55 yachts attended this event which included luncheons, tours to town and a village and the Gala Dinner attended by the Assistant Regent. At each of these events we had nominated a country to be the special guests both to receive complimentary gifts or representational duties and also to express our appreciation to the hosts. The USA was the country selected to respond at this function and under the capable guidance of Mark and Judy on Windbird we had a top event. The welcoming dance was quite different being upbeat, much more dramatic. Costumes were as always very colourful and decorative. Following official welcomes and speeches the fleet contributed to the festivities with songs by Lieda (Viajero), Peter (The Southern Cross) and trumpet - Rob (Mary Eliza). Jen (El Misti) lead a group of children in a skippy act, Allison (Saraoni) thanked the town folk with a wonderful speech in Bahasa and Anne expressed our appreciation to Raymond and Dewi for their role in orchestrating the Indonesian program. Mark (Windbird) started our thanks to the Assistant Regent with a flag parade of all nations in the Rally (15) and this provided a visual backdrop to the rest of the closure proceedings including the presentation of the Sail Indonesia plaque to the Assistant Regent. At the conclusion of the speeches the yachties sponsored a fireworks display following which the dancing continued into the night. All of this occurred under a full moon on a delightful fine white sand foreshore attended by many local people. An earlier rain shower had passed to leave us to a cloudless and balmy night. Memorable, and people ask you if you ever get bored! In looking back at what has happened in the last 2 1/2 months as we cruised though Indonesia, it is easy to see why this may be the biggest and most comprehensive Yacht Rally in the world. With a starting fleet of over 100 yachts we will cover more than 3000 miles, visit a dozen major islands ranging from the most primitive to the most sophisticated, from the driest to the wettest, cross the Wallace Line and the equator and experience many examples of Indonesian art, culture, community life, products, village architecture and food. We have been hosted by more than 11 Regents or Assistant Regents at a similar number of impressive facilities including palaces. Other areas visited were gardens and World Heritage listed sights. One yachtie took almost 500 photos of the Orangutans alone - what a marvellous device digital cameras are! There has been a strong sense of camaraderie amongst the fleet with many examples of shared dramas and experiences, borrowing items till the next port, fixing broken equipment or sharing views on navigation, sailing, cooking or technology. As just one example I had a broken stainless steel batten car fitting repaired yesterday by a colleague who had a TIG welder on his yacht. Within the fleet there are people with all sorts of skills which are readily contributed when the need arises. Since leaving Lovina in Bali the fleet has sailed North West through the Java Sea and taken a variety of paths. About half the yachts delayed at the Lovina anchorage for a further week before sailing via the North East tip of Java to Kumai on the south coast of Kalimantan to experience the Orangutans and the rehabilitation facilities. This journey involved at least one overnight sail. The other half of the fleet tracked more westerly, either day hopping along the north coast of Java or via a few scattered offshore islands to Karimun Jawa. Again this path involved overnight sails. Yachts passed through large concentrations of fishing fleets operating north from Java and night watches were busy as we threaded our way through a maze of bright lights, flashing LRD lights and whatever radar returns that could be picked up. Channel 77 was active as yachts coordinated information about any large ships sighted and what various fishing boats were doing. A hazard to be found near any fishing centre are Fish Attracting Devices (FADs). FADs are generally bamboo rafts fitted with a palm branch and either floating or anchored in quite deep water. They can be up to 15 miles from an island and to this day we are unsure how they pay for themselves if they really are anchored in water which the chart says is hundreds on metres deep. A few yachts have hit rafts at night but no serious damage was sustained. We understand the FADs provide shade and shelter for small fish which in turn attract larger fish which are then caught or netted. There are literally hundreds of these FADs scattered all along the coast and islands. Karimun Jawa is a collection of 27 islands about 60 miles north east of the main port of Semerang on the north coast of Java. 16 Yachts gathered at the main anchorage in preparation for an organised tour to the monuments of Borobudur and Prambanam temples. The main town at Karimun Jawa is very pleasant and devoid of hawkers although the morning prayers are always to be heard. The local harbour staff watched our yachts as we travelled by ferry for 2 hours to Java to start our 4 day tour. The 33 yachties were in high spirits as we boarded our bus and started the first and hopefully last interaction with Indonesian traffic. Ramadhan ended during this trip and it is an Indonesian custom to travel back to their village, visit family cemeteries and also enjoy a 4 day public holiday. This translated into to a mega traffic jam around Yogjakarta, the temples and anywhere we wanted to go. Despite the frustrations of being caught in this mass of traffic, the tour was both fascinating, educational and provided an insight into Indonesian life. Both temples were an amazing sight whose construction was a source of much speculation. We stayed in home stays/ hotels/ 4 star resort, survived the use of Asian toilets, dined at all sorts of restaurants, visited local craft production centres and were entertained and dined at the Royal Palace. The total cost was about AUD $90 per person per day and was excellent value as it included all costs. On returning to Karimun Jawa we barely had time to unpack when it was time for another Gala Dinner with the local dignitaries at the nearby Resort. Dancing was now back on the agenda so we joined the local community in this ever popular ritual with them. The following morning was a community breakfast where we jointly cooked ashore. See what I mean about no rest to write up journals. On the way back to our yacht we were offered lobster which we gladly bought for the evening meal. This was our last night in Kurimun Jawa - a pleasant town where the people accepted us without all the tourist overlay we had experienced in Bali etc. It was time to get our harbour clearances and plan the trip NE to the Kumai River to enjoy the Orangutan experience. This was an overnight sail in beautiful sailing conditions and flat seas. The towed barge traffic increased in numbers and these provided the duty watch with tracking and avoiding practise. The issue here is to determine their direction of travel and avoid the towed barge which was generally poorly lit. The town of Kumai is about 15 miles up the Kumai River which is a very busy port. Some 40 yachts had gathered here for another Gala Dinner and sight seeing visits to the nearby town as well as booking a trip up the Sekonyer River to see Orangutans in a variety of settings. These river trips are a 'must do'. The costs are very reasonable when shared between say 3 couples as they are fully catered live aboard house boats with all park fees and entrance fees paid and a boat boy to mind your yacht as well. We (like many others) took a 3 day 2 night trip and saw all sorts of wild life enroute. Orangutans are playful, intelligent, naughty, very strong and have an amazing capacity to eat bananas. The record was 8 bananas in the mouth, a bunch in each hand and one in the foot then off to climb a tree. A large Orangutan can eat 25 Kgs of bananas in a meal! During the river passage we saw crocodiles, Proboscis monkeys, Gibbons, Macaques, squirrels and birds. The information centre outlined the history and background about these programs which were developed in 1971. Orangutans are endangered because of the loss of their habitat through forest clearing for palm oil or timber harvesting. This morning we left Kumai for the two night sail to Belitung where we will begin the outwards clearances and final Gala Dinner. A number of yachts have already departed Indonesian waters and others are on their way. This rally has confirmed the value of travel as one way to learn about other countries, their people, challenges and how they cope with the daily round of issues which confront as all. As I write this update, the incoming emails tell of plummeting confidence in the financial markets and likely recession. For these Indonesians we meet in the villages living on their fishing and gardening skills, it is not likely to have much direct effect or even interest to them. 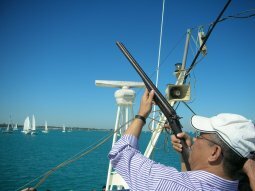 The most common question posed to cruisers who are planning to transit Indonesia by yacht is - what about the pirates? It is amazing how issues which may have been correct 20 years ago continue in our minds even though no longer applicable. While several yachts experienced petty pilfering probably by young men or boys, it hardly rates as a pirate attack. To the contrary we have experienced great hospitality and encouragement to join in with whatever activities are occurring in the villages and towns we visited. The village people are certainly curious about who we are, where we are from, how many children we have etc and by the way would you like to buy some items. Being a cash economy and generally poor by western standards, they are keen to sell vegetables, fruit and fish. As we progressed west along this island chain we entered the 'tourist' zone. Here we are viewed less as a curiosity and a visitor but a target for selling all sorts of adornments and items. These town folk are probably more like 'sales pirates' capturing your attention, time and money if possible and preventing your escape. We noted this trend as a passed through the Komodo areas and it has strengthened as we left Lombok Island and sailed to Bali. I think the previously mentioned Wallace Line (look it up in the Lonely Planet Guided for more details)applies equally well as a defining line for tourists. The trip across the Lombok Strait was fast and reasonably comfortable although for some yachts heading to the Benoa area (where there is a small marina and commercial anchorages near Serengang Island) the trip can be best forgotten. The current runs south in varying strengths but the wind seems to be invariably 20-25 from the south and this combination of wind against current produces a very short steep sea. As we were heading west along the north coast of Bali to Lovina we had a most pleasant and fast trip in beam seas and wind across the Lombok Strait. As usual with sailing in these waters the wind initially followed the coast line around Bali to give us a downwind MPS (spinnaker) run but this wind died and we reverted to motoring till we pulled in to the coast for the night. A short walk ashore that afternoon and a chat to some folk sitting on the beach confirmed our initial observations that this north shore line is populated by foreigners who have built fantastic permanent or holiday mansions. There are classic Balinese gardens, lush tree lined lanes and Hindu temples everywhere we walked. It was a major change from everything we had experienced so far on this journey. We subsequently agreed that it was as well to travel from the poorer and more rugged eastern provinces to this softer and easier living area. Bali is a lovely island and apart from the persistent and often annoying hawkers in the major tourist areas such as Kuta the living style is very attractive and would be hard to leave if you knew what awaited you in the eastern areas. Lovina is a good anchorage where 50 yachts gathered for the next organised event. Although on the occasional day a northerly wind made the anchorage rolly, it was generally comfortable and safe. The town is very pleasant and the local hawkers had been threatened with arrest if they unduly pestered us. The beach front has many bars, restaurants and services such as shops, massage, transport, internet etc. Most yachties took road transport to the southern areas such as Sanur and Kuta as well as the many inland towns and standard sites to be visited. These included, waterfalls, crater lakes, temples and gardens. Near Lovina is the old Dutch capital of Singaraja where a large supermarket was high on the list of those in charge of provisions and the galley. Mind you an even grander supermarket in Kuta stocked every item you need to run a kitchen and at good prices. Nevertheless a visit to the nearby well stocked local market in Lovina provided all the green vegetables and fruit that are needed on a cruising yacht. While all this was occurring, others attended to the usual tasks of extending Visas, processing port clearances, refuelling, watering and yacht maintenance. There are plenty of boat boys to give your hull a clean although water temperatures are such that it is a joy to take a plunge and give your hull a wipe as you go. In keeping with the more sophisticated environment of Bali, we enjoyed a very pleasant 'gala dinner' (note all dinners on this cruise are Gala Dinners) at an up market seaside restaurant. Our welcome was via a receiving line complete with a flower for your ear/hair. The Vice Regent attended, spoke eloquently and briefly and even sang a song in response to a duet by Robert on the trumpet and Peter singing 'We are Sailing' with lyrics amended to suit our situation. Canada was our responding country and Darryl (Cankata) did a fine job of thanking our hosts. A band and singer completed the evening entertainment and for the second time on this cruise the yachties did not have to dance. Other Rally events included a celebration of the running of the bulls in a nearby flooded padi field, Balinese dancing at the beachside pavilion and some skits parodying hawkers trying to sell masks to yachties. The dialogue was in Indonesian but must have been good as the locals were in fits of laughter. While we missed the bull event it was apparently a great spectacle as colourfully decorated bulls dragged sleighs through the flooded padi in some sort of a competition. The event is supposed to ensure a good rice planting but it did cover all those who took part in a thick layer of mud. This opportunity to visit and experience a wide range of environments and lifestyles in Indonesia continues to enthuse most yachties. It is a topic for endless Happy Hour discussions and has displaced those distant memories of being 'impounded' by Indonesian Customs in Kupang. All these events add colour and variety to this cruise through Indonesia which continues to be a source of amazement and enjoyment. We continue our journey westward to Karimun Jawa which will mean a few overnight sails as island anchorages are few. Shipping will increase in numbers as will larger fishing boats. Not all yachts will go to this next port. Already several yachts have departed Indonesian waters for South Africa, Singapore and back to Australia. Our morning HF sked provides a regular link to these more distant yachts. As always there is a chance you will meet them again in some corner of the world. Every day is different and there is always lots to do or be done. The other most asked question we receive (apart from concerns about piracy) is - don't you ever get bored? Never. About 50 yachts gathered on the NW coast of Lombok Island for the Rally event at approximatley 08° 20' 116° 06' which was held on Saturday 13 September. There were several anchorages used in the area with the most popular being on the southern shore of Gili Aer which is one of three resort islands just off the Lombok coast. These small islands can be circumnavigated by foot in 2 hours or a bit quicker if using a Lombok taxi - pony and two wheeled buggy with car tires. Lombox taxis are very common in the coastal towns and most yachties took the opportunity to try this mode of transport. The resort islands are a mecca for tourists looking for a laid back lifestyle although the area was pretty quiet as the season is over. The beach front is packed with all types of bars, restaurants and rustic hotels all overlooking a beach and clear water. The basic yachtie day there consisted of a morning swim and snorkle over the attractive coral gardens followed by a cold Bintang, another dip, another Bintang a delicious lunch, an afternoon sleep and a big discussion with colleagues about what the rest of the world is doing. Thyen it is time to prepare for the evening sundowners and dinner at another beach side restaurant. Typically meals cost from AUD $2-10. After dinner its back to the yacht to sleep and prepare for another exhausting day on the cruising trail. What was that about a traffic jam in Sydney on the Harbour Bridge? The actual Rally event was held on a beachside park where a traditional welcome of fresh coconut and bananas greeted the 100 yachties who attended. We all sat on woven mats on the ground for the ceremony - caused a few tight joints for the more elderly. After a short round of welcoming speeches from various dignitaries and a response by Aki (the sole Japanese sailor in the fleet) the evening meal was timed to coincide with sundown which marked the end of the daily fast. It is Ramadan here and Muslims are quite dedicated to the requirements to fast each day between sunrise and sunset. The meal was simple and tasty. There was no singing and dancing which had been a hallmark of previous cultural festivals. Again this was in response to the requirements of Ramadan. Lombok Island is close to or forms part of the Wallace Line which is the boundary between Asian and Australasian fauna and flora. Without seeing too much supportive evidence, it was noted that Lombox was greener and more densely populated than the eastern islands which have been the Rally's backdrop for the last 2 months. Lombok Island contains the second highest mountain in Indonesia and it can be climbed although taking several days for the return journey. Many crews spent a day driving through the countryside and visiting villages specialising in pottery, weaving and traditional ways of living. These trips included visiting Mataram which is the largest town visited so far and it is well equipped, busy and very commercial. While specialist spares may need to be imported, most standard items such as batteries and general hardware was available. One yacht was very happy with some aluminium welding done to his headsail furler. Often a search of several areas was required to unearth the required items but these packed hardware stores seem to have everything tucked away in the back. Yachts are now crossing the Lombok Strait where the morning horizon is dotted with hundreds of solo Indonesian fishermen sailing 'spider boats' in this 25 mile wide channel looking for tuna. 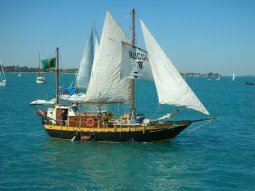 The boats are equipped with two high set outriggers attached to a long bamboo float and a lateen sail and get along remarkably fast. They are a great seafaring lot as they daily face the challenges of wind against swift currents in 25 knot winds, transitting super tankers and often no motor or life support equipment. During the last week the yachts have had to make over 200 miles from Labuan Bajo to this location and the whole westward journey has experienced a prevailing east setting current. It varies in strength typically about 1 knot but sometimes up to 2 knots. It can be much more when crossing a Strait. Using software program to determine the moon's upper and lower transit which provides a basis for predicting the flow in these straits at least for timing and general strength. Fortunately after leaving Labuan Bajo we have experienced more wind and thus been able to sail for most of the day however many hours of motoring is standard for this time of year. Typically the wind is strongest from the south when crossing a strait or large bay where the wind funnels between the high coastal mountains. If sailing close to shore to avoid the current, the wind strength drops to zero as it does most evenings. A gentle land breeze (eg offshore) often develops through the night and assists with early morning departures. Typically yachts motor or motor sail 30-50 nm in a day. While anchorage will be sought in a bay or behind a small headland, the seas are generally flat and in many cases yachts just head inshore until they find anchorage in 5-10 m depth hopefully not amongst bommies. One group of yachts had seriously fouled anchors in 100 ft of water but an elderly skipper was an experienced diver and was able to recover them but not without a few close calls such as one anchor almost jamming his hand under some coral and the water being so stirred up that visibility stopped recovery for an hour. The alternative was to cut the chain and lose the anchor. The scenery along the north coast of these islands is dramatic. There are volcanoes (active and dormant) quite near the coast and the land form is rugged with steep slopes and lots of lava rock areas. Habitation is mainly along the fringing narrow plain where small villages are common. If a valley or gorge ends in a small flat area of coastal land this will be converted to rice padi which is cooperatively worked and shared by that village. There are paddle powered outrigger canoes and motorised fishing vessels everywhere. Fishing is a fundamental source of food and fishing canoes can be regularly found many miles from shore. Brightly lit fishing boats can be seen from almost any anchorage. Fish attracting devices - FAD (barrels, floats or log rafts) are regularly found moored in very deep water eg several hundred metres - a practice whose actual effectiveness is not fully understood. Whereas Flores was extremely rough, dry and barren in nature, we noted the islands became greener and more cultivated as we sailed west. Whereas skies had been cloudless in Flores, there is much more cloud development in these areas. We have recently experienced two brief rain showers but expect to see more from here on. The morning HF sked allows the fleet to exchange position reports, seek or provide information on conditions and anchorages and arrange chat sessions with distance colleagues. The VHF radio which is limited to line of sight is used within a group of yachts for general communication. The next event is at Lovina which is a town on the north coast of Bali. Several yachts have not been seen at rally events for a month or more as they have been following the surfing trail along the southern coast. No doubt there will be many tales to tell at the next reunion. Labuan Bajo 8° 31' 119° 52'. About 50 yachts gathered off the old town of Labuan Bajo for the scheduled stopover on September 3. The anchorage area was split between one close to the main town and another, an open area off an eco-resort about 2 miles away at 8° 31.08 119° 52.13. The flavour of this town was more commercial, busy, touristy and less impressed with the arrival of the fleet of yachts. Yachties were almost outnumbered by other visitors, tourists and back packers who use Labuan Bajo as a place to base while booking visits to the Komodo National Park and the many dive sites. Nevertheless yachties found it very enjoyable and interesting as they wandered up the main street overlooking the very full port area and exploring the many hotels, restaurants and shops selling every conceivable item from propellers to hardware to clothing, bags, shoes and road side food sellers. A large and modern style Chinese Emporium supermarket was well stocked and patronised. The local fresh food market was excellent and most yachts restocked. The welcome ceremony was held in a nearby park where we were first introduced to a local competition called 'cacti dancing' where the men dressed in decorative and protective clothing representing a buffalo and tried to land a blow from a short whip on the opposition. The person being attacked had a shield and a curved rod to ward off the single blow allowed. There was much chanting and dialogue between the contestants the focus of which was lost on the yachties but was presumed to be taunting the opposition. As this "game" looked like going on all afternoon before the actual welcome ceremony, so many headed off to a bar in town to replace the fluids lost via perspiration. The evening ceremony, dinner and entertainment was held in the park and attended by the Regent (Governor) and was most enjoyable. Five representatives of the fleet were presented with a white chicken as a sign of good will and were supposed to drink some locally brewed wine called Arak but apparently it had been forgotten so the chicken had to do - it was kindly handed back as chickens and yachts do not mix well. The cultural performance was very well presented with the style of dancing different and slightly more modern in foot and body movement. Peter from The Southern Cross was identified as having his birthday coincide with the show so after wishing him a Happy Birthday he kindly led us all in a rendition of Waltzing Matilda. Peter is an excellent singer. As usual yachties were encouraged to join in the dancing with the 'stepping through the clapping bamboo poles' a highlight with Jo from Just Jane showing us all how to do it in style. Next morning many yachts departed the anchorage for Rinca Is where Komodo Dragons can be seen as you are guided through the National Park. On our 2 hour walk up a valley in the Park accompanied by a ranger, we saw buffalos, pigs, deer, megapods (bush turkey) and watched 14 Komodo Dragons feeding on a recently deceased buffalo. The bite from a dragon gets infested and causes the death of the beast which then becomes the meal for any who can smell it. With 200 miles to the next event in Mataram on September 13 most yachts are moving west along the northern shores of Komodo, Sumbawa and Lombok Islands. While more wind has been noticed in this area, almost every yacht has to motor. Currents in the straits between the islands need to be calculated and timing adjusted accordingly as they can be fierce. The land is arid and mountainous. Water clarity in many anchorages is excellent and swimming and "Happy Hours" on the sandy beaches are part of the daily routine. I wonder how the traffic is building up on the Sydney Harbour Bridge as we experience this cruise through a very interesting country. The Ende Regency celebrations were centred on the village of Muasambi 8° 30.1' 121° 47.1'. This is an open anchorage and the east wind of up to 20 knots which assisted most yachts in reaching this area then produced a rolly anchorage for the next few days, these conditions are infrequent but when they occur the anchorage is uncomfortable. Consequently quite a few yachts moved further west and did not experience the warm hospitality and full program arranged by these people. The Regent (local Governor) went to great lengths to ensure we were welcome. Considerable facilities had been specially built for this event, a substantial dinghy dock, large circular dining area, entertainment stage, first aid centre, stalls for fruit and vegetables, cafe and craft. The program was extensive and well organised including the now usual welcome ceremony, gala dinner, entertainment, dancing and singing. Yachties were always encouraged to join in or sing, a trumpet solo by Robert from Mary Elisa was followed by a duet and was quite special. The main focus of each evening was a cultural program and dancing competition between the various villages. A very good backing group of male musicians kept the guests fully entertained. During the day there were tours to the 3 coloured lakes at Mt Kelimutu as well as nearby villages that specialise in such products as Arak/Moke (a liquor distilled in bamboo pipes from palm sap), palm sugar, cocoa, coffee and other produce. The scenery during these tours varied from paddy fields to lush jungle and spectacular mountain ranges. Excellent English speaking guides provided the commentary and information on village life and customs, they continued to look after our every need. Unfortunately during our stay a nearby house burned down one afternoon, a collection was quickly arranged and that evening it was presented to the family. A crew member became quite ill and despite being put on a drip did require hospitalisation for two days. The care provided was excellent and visitors included the Regent complete with entourage and a string of doctors, nurses and members of the organising committee. The fruit and vegetables available in the stalls were high quality. By the end of this program yachties were exhausted as the days were full and we were not used to so much dancing! The thoughtfulness, generosity and extent to which villages go to look after us is overwhelming. The next major stop is Labuan Bajo on the western tip of the Island of Flores, the winds are light normally not exceeding 10 kts. There are 50 yachts at Sea World ready for the welcome ceremony and dinner tonight. More yachts are anchored at Wodong 8° 36.3' 122° 28.5' 0miles east and will come to tonight's event by bemo. The anchorage is fine except it drops away to 35 m deep in places only 200 meters from the shore. Most yachts have satisfactory depths less than this and the winds are mild. There is plenty of good provisioning ashore and in the markets a few kilometers up the road to Maumere. A bemo ride to Maumere 15km west of Sea World uncovers a wide range of shops, spares, markets, service stations etc. A colleague bought new starting batteries (NS 70 12 v) for half the Australian price. Items such as long life milk can be found at similar prices to Australia. Ice creams can also be found at a bit less than Australian prices. Dinner and entertainment at the resort last night was excellent, the price per head including drinks was AUD $15. The setting was under palm and casurina trees overlooking the anchorage and very attractive. This is cruising! About 75 yachts anchored at Lembata 8° 22.2' 123° 24.5' for the 3 day event which were filled with a busy schedule of events and tours. The program included a welcome ceremony ashore where yachties were given a special blessing and then entered a set of gates built for the occasion, then followed a cavalcade of motor bikes and utility trucks which carried all the yachties around the town and surrounding countryside. This procession was lead by a police van and a troop of Timorese ponies and mounted traditionally dressed warriors. The reception by shopkeepers, school children, workers, farmers and home folk was over whelming. The 500 metre long procession was accompanied by much horn tooting, cheers, hand slapping and hellos. An evening dinner and reception was hosted by the vice Regent and included events staged by school children and traditionally dressed dancers. The next two days included local tours one of which is to a village which focuses on whale catching. Yachties watched as about a dozen long boats returned after a day's fishing. The main catch was 4 Manta rays which were shared around the village. More adventurous couples climbed the nearby volcano and returned exhausted by a full day of walking from the drop off village. There were two evening cultural events where yachties participated in the full range of dances, games and even some bow and arrow shooting at wooden discs rolled across the stage. The last day included a visit to a primary school. taking on fuel and drinking water and a visit to the markets for fresh food. 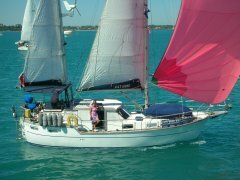 Yachties were just about toured out after this program and on departure took the opportunity to stopover at a nearby anchorage which included a pretty sand cay for a swim, rest and "Happy Hour" ashore. The Lembata experience provided another example of just how friendly, generous and hospitable these Indonesian people are. The flotilla is now moving slowly west along the north coast of Flores and enjoying protected anchorages in very clear water. A total of 50 yachts went to the festival at Kalabahi on Alor Island, numbers were down compared to previous years as during the passage from Kupang the fleet encountered a 3 knot current against them and during the night stong winds made the crossing difficult, as a result many of the yachts went direct to Lembata. In Kalabahi the participants went on bus trips to the interior and the north coast. The anchorage here is well protected deep inside the bay with none of the anchoring problems that were experinced in Kupang. At the evening function the local committee dressed some of the participants in traditional costume to the delight of the hosts and their guests at the welcome dinner. 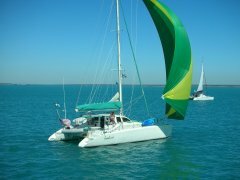 All the fleet that have left Darwin are now in Kupang, some yachts have been delayed in Darwin for a variety of reasons. There was some confusion among the fleet as each yacht arrived in Kupang the Indonesian Customs placed a sticker on each yacht preventing them moving outside the port of Kupang until the Duty Exemption Certificate was completed. Again this situation was caused by the ongoing confusion over the implementation of the Indonesian Customs Duty for visiting yachts. The local Customs were unprepared for the arrival of the fleet with the regulations being interpreted differently on different days, however on Sunday 3rd after each yacht had completed the single page Exemption Document and paid Rp50,000 ($5) all the stickers were removed and the yachts were then free to travel anywhere in Indonesia. There was a lot of confusion among the fleet regarding these procedures caused in part by a language barrier and the "cruiser rumors" which were travelling faster than the Customs paperwork and as result a number of blogs and yacht websites were publishing information that was not accurate or correct. Only 2 yachts are still to arrive in Kupang. Winds are up to 18 knots near Darwin with seas confused and uncomfortable. The official welcome dinner was held last night which was a colourful event, Rebecca Jane was reported as 316 nm to SW tip of Timor. List of reported positions. 4 yachts are still to arrive in Kupang. Winds remain very light and many are motoring in the flat conditions. Furthest yacht from Kupang is Tonic at 180 nm to SW tip of Timor. 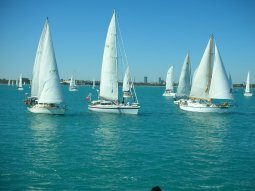 A number of yachts have been delayed and have not yet left Darwin. List of reported positions. Only 4 yachts are still to arrive in Kupang. Winds remain very light so all are motoring in flat conditions. Kupang is an open and now crowded anchorage with lots of water activity. Decorations adorn the shore line and loud music reverberates from the rock band. The arrival of the fleet is a source of great interest to the community. Furthest yacht from Kupang is Tonic at 308 nm to SW tip of Timor. List of reported positions. About half the fleet are in Kupang. Winds have been better but light winds will prevail. 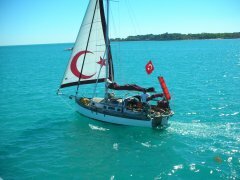 Furthest yacht from Kupang is Tonic at 438 nm to SW tip of Timor. Several yachts remain in Darwin awaiting spares/crew etc. List of reported positions. Furthest yacht from Kupang is Dreamweaver at 278 nm to SW tip of Timor. Several yachts remain in Darwin awaiting spares/crew etc. List of reported positions. Conditions remain fine but there is a lack of wind and this is unlikely to change. Most if not all yachts are motoring. Nearest yacht to Kupang is Mata'irea at 80 nm to run to SW tip of Timor and the furthest yacht from Kupang is Sandpiper at 340 nm to SW tip of Timor. Several yachts remain in Darwin awaiting spares/crew etc. List of reported positions. At 4 pm all yachts reported conditions were still very light with the yachts streched out out over 260 miles, with Mata'irea only 170 miles from the western end of Timor and Muskatelle 260 miles behind. On the 8am radio sched the fleet reported that conditions were continuing to be light with the upper wind speed of only 10 knots, while this makes for smooth sailing progress is fairly slow. The next report is at 4 pm today. List of reported positions. The Sail Indonesia Rally was started on schedule at 11 am today by the Indonesian Consul to Darwin Mr Harbangan Napitupulu. As you can see in the photographs below the Rally began in ideal conditions under a picture perfect clear blue sky in a following 8-10 knot south east breeze. The 110 yachts that made the start line made wonderful spectacle with one of the largest mass starts of yachts anywhere in Australia or South East Asia. Some of the fleet have had last minute technical problems and will leave Darwin in the next few days and rejoin the main fleet.